If you were not at Dallas Market Hall on August 9 & 10, then you missed out on an amazing opportunity to learn from and connect with 2,200+ members of the built environment representing 1,065 companies. The event, which is the largest not-for-profit, self-produced, volunteer-driven, design specification-focused regional expo and conference in the USA, celebrated 16 years of industry collaboration and attracted 55 event sponsors, more than any other year in the event’s history. For the second year in a row, five associations joined forces to plan and execute a more expansive event for their members and beyond: (in alphabetical order) ASID Texas Chapter, ASID Texas Gulf Coast Chapter, CSI Dallas Chapter, NEWH Dallas Chapter, and USGBC Texas Chapter. METROCON18 showcased 160 Exhibitors representing 211 manufacturers, service providers, and organizations representing all practice areas and market segments, and it attracted interior designers, architects, facility managers, students, and a myriad of other essential design industry members from Texas, Oklahoma, and 22 other states across the USA. This year’s conference delivered 51 hours of premium programming on timely topics presented by 62 industry experts. Offerings included two Seminars, two Student Programs, five tours, a Keynote that doubled as a CEU, and 40 other continuing education courses. All CEUs were IDCEC-approved and qualified as CEPHs to meet requirements for Registered Interior Designers and Architects for the Texas Board of Architectural Examiners, and many also were approved by AIA, EDAC, and GBCI. Keynote Speaker Steve Glenn of LivingHomes and Plant Prefab spoke about his commitment to healthy and sustainable construction. Create Better Spaces: Autistic-Friendly Designs presented by interior designers Julie Truong and Jackie Wheat, RID, LEED AP with Principal Kelly Baughman, all with Houston A&D firm PDR. The panel emphasized that by understanding all human experience through research, we can create better spaces and serve all who inhabit them. Truong herself has autism, and despite it being her first public speaking engagement, the reaction of those who attended was overwhelmingly positive: “the best CEU,” “one of my favorites,” and “totally fantastic!” After her talk, Truong herself said that the experience had made her “a stronger person” and thanked us for giving her the opportunity to push past her comfort zone. Boost Your Brain Performance: Dee O’Neill, MS, LPC, the Senior Clinician and Corporate & Executive Program Manager with the Center for Brain Health, walked her audience through steps to take to revive mental energy, enhance strategic thinking, and incite innovation with healthy brain habits in order to enhance their professional and personal lives. The Statler Reborn: Gale Nall, RID and Lee Fluker, RID of Merriman Anderson Architects explored the challenges and triumphs of their $175 million, four-year renovation of The Statler Dallas. The building, which had been on the “Most Endangered Historic Properties” list, has been transformed into a luxury property with 159 guest rooms, 219 apartments and five food and beverage venues. ASID’s Design Pathways offered students an expert panel discussion accompanied by a guided tour of the trade show floor with in-depth discussions with ASID Industry Partners. Student Programming: On the second day of the show, ASID Headquarters presented Design Pathways, which combined a panel discussion with trade show tours. Four experienced design professionals – Nicki Estes, RID, EDAC, ASID, LEED AP ID+C of Perkins+Will; David Euscher, ASID, IIDA, LEED AP of Corgan; Amie Keener, RID, IIDA, LEED AP, CDT of Gensler; and Ana Pinto-Alexander, RID, IIDA, EDAC of HKS – explained to emerging designers why trade shows and conferences are so vital and the importance of participating in them throughout one’s career. 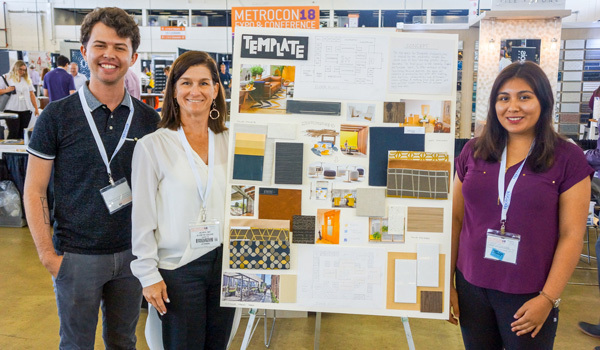 Afterwards, the designers led small groups of students around the trade show floor, visiting manufacturers Armstrong Ceilings, Arizona Tile, Benjamin Moore, Hufcor, Karndean Designflooring, and Sherwin-Williams for presentations and discussions. Tours: Landmark Sponsor Dallas Market Center partnered with METROCON18 for tours of their Light + Design on TEN showroom. During five one-hour tours over two days, 20-person groups were shuttled to and from the World Trade Center, receiving a guided tour in order to experience the 20,000 SF lighting center that showcases a curated collection of the world’s leading lighting manufacturers and designers. The planning Committee wholeheartedly thanks Landmark Sponsor Dallas Market Center, Media Sponsor Modern Luxury Interiors Texas, and the 53 other METROCON18 Sponsors, as well as all of this year’s Exhibitors, for their incredible support. Some Exhibitors stood out among the rest. Congratulations to the recipients of the 2018 Pegasus Exhibitor Awards! WAC Lighting / Modern Forms won the “Best of the Best Award” in the 2018 Pegasus Exhibitor Awards. From a more open trade show floor plan with expanded visibility to an altered show schedule to benefit both attendees and exhibitors, METROCON implemented many new ideas based on last year’s post-show survey feedback. Team 4 representing El Centro College, Texas State University, and the University of North Texas won 1st Place in METROCON’s inaugural Design Charrette. Selfie Spots: We live in the era of social media, and for those manufacturers with products perfect for selfie backdrops, we offered the opportunity to showcase them on one large surface instead of in a traditional booth. Thank you to Speech Privacy Systems for sponsoring and building our three Selfie Spots structures, and kudos to National Wallcovering, Positive Marketing USA, and Wolf Gordon for being guinea pigs for this exhibition experiment. Mobile Event App: For convenience and environmental reasons, people have asked us to use less paper. We responded by expanding the capabilities of our mobile event app. Instead of using paper surveys, this year attendees provided feedback on educational sessions directly on the app. Also, instead of using printed Booth Bingo cards, attendees used the app to rack up points for a chance to win one of two $100 Visa gift cards. Congratulations to this year’s Booth Bingo winners! We partnered with Straydog, a no-kill dog shelter and sanctuary. They are looking for donations of services, time, product and/or money to build a new sanctuary for dogs in need. Community Involvement: As this is the Year of the Dog, it inspired us to work with non-profit organization Straydog, a no-kill dog shelter and sanctuary in the Dallas area. Their primary mission was to raise awareness about the important work they do and encourage the adoption of dogs looking for safe and loving homes. However, we were happy to help them with their second mission: seeking resources to construct a new building to serve dogs in need. (This new collaboration got the attention of Dallas television channel The CW33, who joined us the first day of the show and ran a short segment on their 9:00 PM news hour that evening.) If you are interested in donating services, time, products and/or money to help Straydog’s cause, contact them directly through their website, Straydog.org. Show Manager Laura McDonald Stewart, RID, FASID, IIDA, LEED AP, is extremely thankful to the entire 2018 Committee for their time and dedication to make this valuable event so successful for the entire region (listed in alphabetical order by last name):. We also want to express our heartfelt gratitude to the many volunteers who donated their time on-site during the show to assemble attendee tote bags and speaker gift bags, guide attendees, introduce speakers, and monitor CEUs. This event could absolutely not happen without you! PLAN NOW TO BE A PART OF METROCON19! Mark your calendar now: METROCON19 Expo & Conference will take place in Dallas on August 8 & 9, 2019. Be sure to sign up to receive notifications to stay informed about attending, presenting, sponsoring, and exhibiting at next year’s event!